Continuing in my Ottawa Hospital Food Series I bring you the Children's Hospital of Eastern Ontario's (CHEO's) offerings. What's remarkable about CHEO's offerings is that they can be broken down by time. If you're there between 6:30AM and 2:00PM Monday to Friday you can enjoy CHEO's Rainbow Cafe which according to CHEO's website offers hot and cold meals along with offerings from Pizza Pizza and Timothy's coffee. If however you're at CHEO after 2:00pm or on weekends, well now you're stuck with the Oasis coffee shop open from 7:30AM to 11:00PM seven days a week. Don't worry though, you'll find much more than just coffee at this junk food Oasis. You'll find Mr. Sub, Pizza Pizza, Starbucks and plenty of potato chips, ice cream, sugary cereals, huge bottles of pop, supersized chocolate milks (they don't offer a 250ml only the 500ml, more calories than 2 cans of Coca Cola carton) and if you look carefully you'll see the People's Pantry line of "Perfect Portion" nuts that I complained to the Canadian Food Inspection Agency about their misleading and likely erroneous labeling. But let's get back to the Rainbow Cafe. 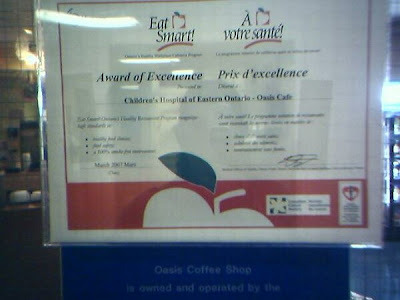 The Cafe's interesting because it was recently designated a "Centre of Excellence" by the EatSmart! program. "Through its "Award of Excellence" program, Eat Smart! Ontario’s Healthy Restaurant Program offers recognition to Ontario restaurants that meet exceptional standards in nutrition, food safety and smoke-free dining." The reason the program's so stupid is because it doesn't actually steer people to healthy dishes and frankly doesn't even care if there are any - all it cares about is whether or not the ingredients in your kitchen could be combined together to make a healthy meal. Want to know what the EatSmart! Centre of Excellence Rainbow Cafe offered patients and staff on May 29th? Western omelet sandwich with homefries. Those are sure some "Centre of Excellence" choices huh? But of course even if the Rainbow Cafe were to change their menu today and actually include healthy and nutritious choices (and before you start telling me there's nothing wrong with grilled chicken or ravioli with rose sauce I'd want to see a nutritional breakdown), you're right out of luck if you happen to go or work at CHEO after 2:00PM or on weekends. Oh, and let's get real here - even if there were multiple nutritious options available at CHEO, the hospital administrators sold their souls to Pizza Pizza, Mr. Sub, Starbucks and Timothy's for a reason - junk sells. 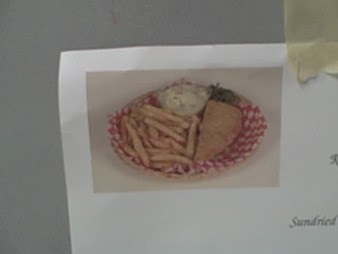 Really, when faced with the option of a slice of pizza, bag of chips and a sugared soda special, are there many parents out there that would force their sick child to opt for a healthier choice even if by some miracle something other than simply a salad were available? Gee thanks CHEO for looking out for my children's best interests.